In the first part of this article, we have taken a good look at the perfectly located villas away from it all. Today, we will go into town and see where to stay if you want to be close to all the action everyone is talking about. If you came to Hvar to see the culture, enjoy an evening of wining and dining on the town, and perhaps for a spot of partying in the wee hours, you will want to choose one of the villas close to all the action. Make no mistake, being close does not mean you will not enjoy privacy. Large property sizes and lush gardens of the town villas will ensure that you can rest and recharge undisturbed. When you eventually retreat back to your lodging, you might appreciate a lovely selection of fine wines kept in the cellar, the restorative powers of wellness and Spa facilities, and a refreshing swim in the pool. Take a look at some of our favorites. Why not enjoy a holiday as billionaires do? Or, if you happen to be a billionaire, just enjoy one as you are accustomed to. Hermes is a spacious, 700 m2 villa on a 2000 m2 estate with an infinity pool. The villa is located about 20 minutes from the center of Hvar town, beneath a cliff, surrounded by nature, and absolutely devoid of the traffic noise. It is close to the action but removed enough to not be bothered by anyone. A view from each of its three terraces opens into a 180 panorama of the shimmering sea and the islands of the archipelago. There is a great energy to the place. Step in to discover a thoughtfully designed interior, adorned with beautiful, hand-made wooden furniture and opulence of interesting details, like tapestries, arches, and decorated candelabra. Oh, and a blue fireplace, shaped like a spacecraft. With the decorations and the overall theme, Hermes brings a touch of the exotic Orient to our shores. We think it is a beautiful combination. Are you a daring soul? Step right in, but know that when you discover this incredible heritage villa in the center of Hvar town, you risk becoming addicted to beauty. Theia was built in 1612 and owned by different venerable Hvar families throughout her history. Today, the estate comprises of connected Gothic and Baroque houses that hide delicate luxury in every detail. Inside, you will find a wellness area with sauna, jacuzzi, massage and relax rooms, a wine cellar filled with a great selection of domestic and international bottles. Outside, the inner courtyard with a herb garden and a large table make a perfect place for al fresco dining and sharing moments in good company. Step out on the stone-paved balcony to savor the view of the towering Fortica and Pakleni islands. To top the experience off, a housekeeper, cleaning person and gardener are at your service at all times during the stay. Phoebe has an irresistible minimalist vibe, which, coupled with her charming location at the edge of Stari Grad (about 1 km stroll from the center), makes her a perfect choice for a relaxed holiday. Even as it belongs to the larger group of towns on Hvar, Stari Grad is very different from Hvar town. Its appeal comes from the relaxed, nonchalant authenticity, seen in every corner. A great place to explore, enjoy a stroll, and taste the offer without drowning in the mass of people at every turn. Phoebe makes a great base for a holiday. Lounge on the attractive terrace and refresh yourself (or swim against the current) in the large pool. If you have brought some work along on your vacation, do it in the relaxed ambiance of a beautiful and cozy villa’s study. 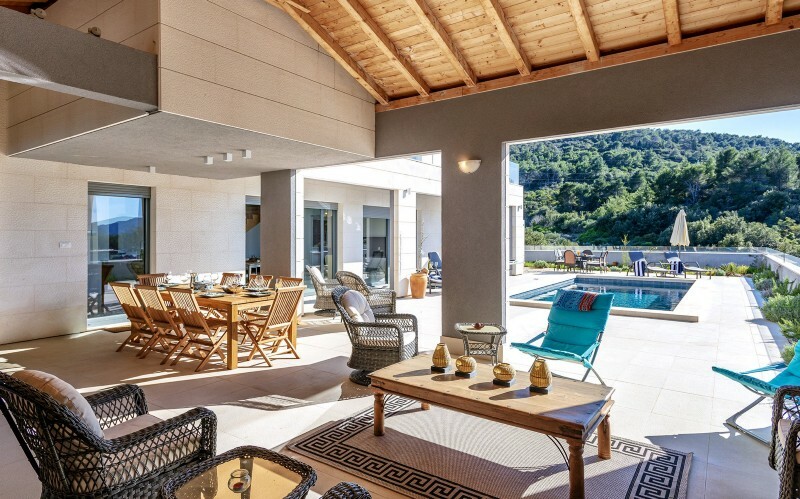 It is fitting that Phoebe should have an incredible amount of doors (more than any other villa on Hvar), as it will become your gateway to a perfect holiday. Everything about this villa, named after a sea deity is in the service of an incredible seaside vacation. Poseidon enchants with an eclectic mix of textures, color, and details. Floor heating makes it warm and cozy for those off-season visits. While indoors, you might enjoy a glass of wine from the villa cellar, seated at the centerpiece mahogany table that doubles as a billiards table. When the great outdoors lures you from the luxurious lodging, take a kayak from the storage room and cast off or hop onto mountain bikes and go for an adventure. If you prefer not to venture far, why not spend some time soaking up the sun or swimming in the crystal sea at one of the quiet beaches just below the villa. You will find happiness as soon as you smell the salt-scented air. This might be as you are reclining on the neatly trimmed lawn beside the lovely pool, surrounded by a lush garden. You will fall in love with a delicious selection of tastes in the wine boutique hidden in the basement. You will feel welcome and comfortable when you soak in the warmth of the softly shaped interiors, fine fabrics and luxurious details that adorn Bia. You will be changed, possibly forever. This is the second edition of a three-part article. In the next one, we will check out the list of villas in the larger towns of Hvar. Stay tuned. And, if you haven't already, do check the first part.